Crispin was born in 1668 in Viterbo, Italy. At age five, he was consecrated to Our Lady, to whom he always had a special devotion. He was an apprentice shoemaker when he decided to enter the Capuchin Order. There, he chose to be a lay brother, taking as a model St. Felix of Cantalice. He served in several different Italian cities – Viterbo, Tolfa, Bracciano, Orvieto, and Albano, and died in Rome. He worked in the kitchen, garden and infirmary. His custom was to spend the night praying and making penance. When he was placed in charge of the kitchen at Orvieto he built a small altar to the Holy Virgin there. This simple shrine was visited by great lords and Prelates. Once even Pope Clement XI visited his kitchen to pay homage to the Mother of God. The governor of Orvieto and the Bishop often would visit with St. Crispin to hear his thoughts on various topics. For many years at Orvieto he was the quaestor, the brother who requests alms. When another brother was appointed in his place, the people refused to receive the replacement or give money for the monastery, and the guardian was obliged to restore Crispin. He became gravely ill a few days before the feast day of St. Felix of Cantalice (May 18), his patron saint. When the monks told him that he would appear before God shortly, he replied that this would happen only after St. Felix’ feast day, otherwise his death would disturb the commemoration. He died on May 19, 1750, and was beatified on May 21, 1806. There are many extraordinary things in the life of St. Crispin of Viterbo. First, let us consider his contagious piety. This can be noted in the episode of the small altar he built to Our Lady in his kitchen. You can consider that if so many personages – and even a Pope – went there to venerate her in the simple altar of St. Crispin, it was because the shrine had become famous. This only would be possible because of Crispin’s communicable piety and the graces Our Lady gave to corroborate the good initiative of her devotee. 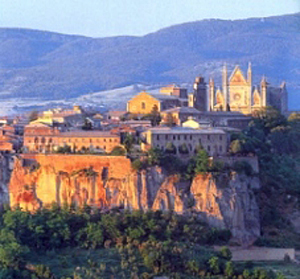 Above, the city of Orvieto is constructed on a high cliff. 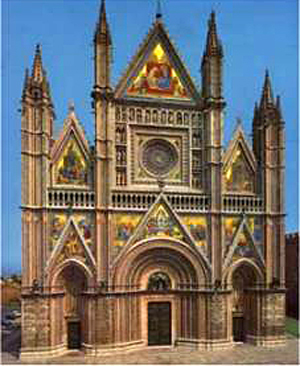 Below, the gothic cathedral of Orvieto with its mosaic façade. Second, it seems useful to comment on the scene of the governor or a Bishop visiting with St. Crispin. Let us take the governor. Let us imagine the city of Orvieto, a city of a certain importance at that time, with its beautiful gothic cathedral that has the peculiar characteristic of having colorful mosaics on its façade. It was a poetic and prestigious city also famous for its good wine. At the end of an afternoon, the shops are closing and people are leaving their stores to return to their homes. As the movement begins to slow down, the church bells peal, calling the faithful to the blessing of the Holy Sacrament. The faithful cross in front of the governor’s palace and move toward the church in the blue shadows that precede dusk and envelop the city. Inside the palace, the governor has finished his work-day and is taking his rest. But for that rest, he has invited someone to chat. This someone is a simple monk, a lay brother, St. Crispin. There is no pretension in the conversation, no affectation, they talk naturally. On one side is the most important civil authority of the city, on the other side a simple lay brother. Together they exchange ideas. The scene has the beauty of the harmony of contrast: the great and the small fit together. They have a mutual admiration for each other, and with this they transmit the sweet perfume of a society that is in accordance with Our Lord Jesus Christ. How different it is from the continuous class struggle of modern societies! Third, regarding the episode of the nun who always treated him badly, it should be stressed that the attitude of St. Crispin was not a sentimental one. He took a very logical approach, for in fact each one of us should know his defects, acknowledge them, and hate them. St. Crispin certainly did this. And because he did so, he thanked God for the bad treatment of the nun, since on that point he and she were in agreement. I don’t know the reason why the nun treated him badly. If she were not doing so for the glory of God, and one may suspect that she was not, then she should be censured. But this is already another topic. 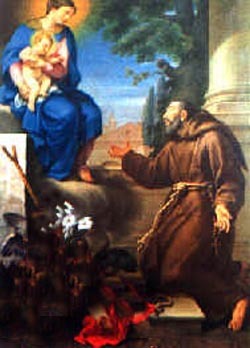 Fourth, St. Felix of Cantalice had also been a Capuchin lay brother. The lives of both St. Felix and St. Crispin represent a glorification of humility, goodness, and a peace and serenity of soul. Such example provides a necessary balance for many Catholics who are called to dedicate themselves to the fight against the enemies of the Church. When we admire one thing, it is good to admire its harmonic contrast. With this, we prepare our souls to acquire Catholic wisdom, which encompasses all the virtues. Doing this, we will prepare ourselves for the Reign of Mary, a society in which all the harmonic contrasts will shine.